Throw the butternut squash in to the oven whole. Turn the oven to 425 and let that sucker bake for 60-90 minutes, or until tender. Once tender, take her out and slice her up; sprinkle one side with salt and pepper. Slice the green apple. I did mine with a mandolin and sliced it has thin as possible. Combine the mayo, garlic, and parsley in a small bowl; set aside. Using the olive oil, fry the slices of bread until both sides are golden brown. When the slices of bread are cool enough to touch, lay the mayo mixture on two pieces, and lay it on thick. 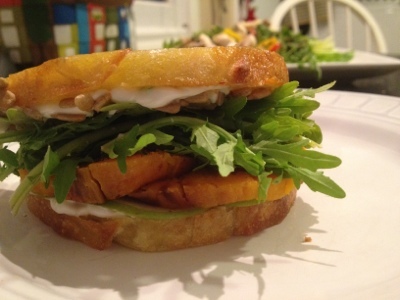 On one side, lay down a slice or two of the butternut squash; then, apple slices; finish that side off with some arugula. On the other side, sprinkle on some sunflower seeds. Put the two pieces of bread together and EAT!